I have a complicated relationship with cancer. Then again, who doesn't? It's not like you can take cancer out of an evening, drinks, dinner, maybe a movie, and then head home for one of those intense discussions that leaves you alone, tearful, and brooding for the rest of the night. Not that kind of complicated. Cancer is one of the few diseases to have wormed its way into common English parlance. A person or situation is malignant. Someone's behavior is cancerous, or their presence is an unwanted cancer (though I'm not certain what a wanted cancer would be.) Norman Spinrad's "Carcinoma Angels" is perhaps the pinnacle of speculative short fiction about cancer. Lilith, the main character in Octavia Butler's DAWN, the first book in her Lilith's Brood series, has a history of cancer, and Ms. Butler uses cancer as both a plot point and a means of exploring the concept of "otherness". Cancer took my mother, father, and paternal uncle. It's taken friends, a lover, and numerous acquaintances. I've sat vigil at the bedside of the dying, giving what comfort I can even if only to close their eyes at the end. I currently have five friends battling cancer, two with great prognoses, the other three on a wait-and-see basis. I've had pre-cancerous cells removed from my cervix and both breasts. 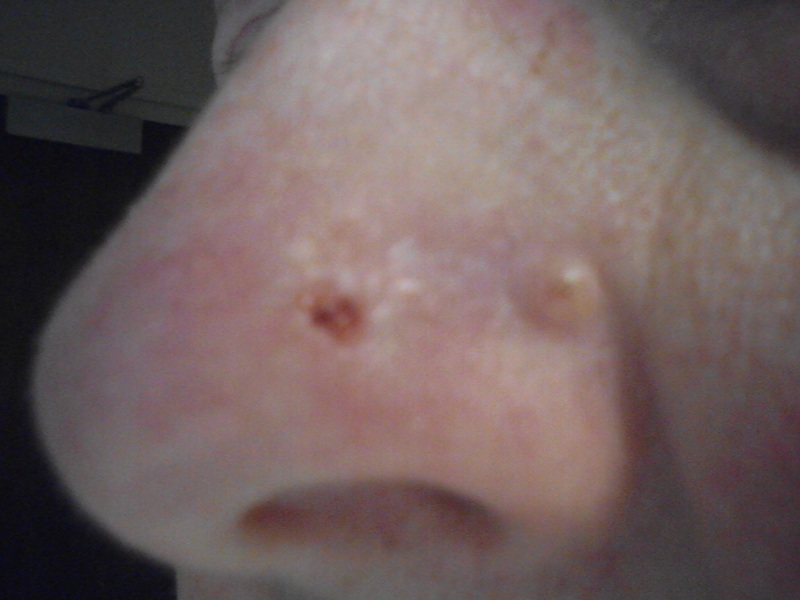 Now I watch the calendar for March 16th, the scheduled date for the removal of a basal cell carcinoma on the left side of my nose. For myself, cancer is another word for fear. It's skin cancer, right? No big deal! I mean, look at it. The scab and the iridescent area are the skin cancer. Basal Cell Carcinomas are one of the most common forms of skin cancer, easy to treat, and rarely metastasize. On the 16th I go in for MOHS surgery to remove the cancer. The expectation from the doctors is that they will be able to get everything, though there is concern for the aggressive growth rate of this particular type and the fact that it has "markers" for kidney cancer. I asked the dermatologist what that means, and was told that if this should go untreated it would most likely metastasize to the kidneys...in, say, 10 years. So, why the fear? To be honest, I'm not quite certain. The rational side of me recognizes that I have a greater chance of being hit by a car, running down the street on a rainy Sunday evening, than I do of anything going wrong during surgery. My emotional side isn't as convinced. I will admit that I am less worried about the possibility of metastasis than I am about other complications: nerve damage; taking too much tissue; not taking enough tissue; facial disfigurement. I went through my own personal hell a few years back when a medically necessary eyelid surgery resulted in a MRSA infection in both eyelids (I'll spare you the pictures.) I'm not eager to repeat the experience, MRSA or otherwise.